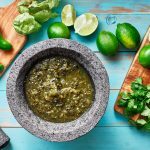 This easy recipe for salsa verde or green tomatillo salsa has a fabulous fresh flavour that will add zip to grilled meats, tortilla wraps or even scrambled eggs. It’s not very often you get to enjoy a fantastic food, great company and an unbelievable view at the same time. 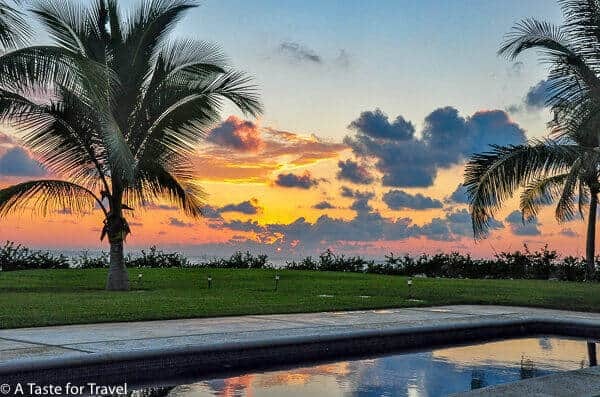 But on a recent trip to Puerto Escondido, I was invited for cocktails, appetizers and dinner at a friend’s villa on a beautiful stretch of beach about an hour outside of town. While we sipped margaritas and snacked on salsa verde and home-made tortilla chips, Chef Tony aka The Mexykan created a delicious meal of ultra fresh seafood pasta, while a technicolour sun set on the Pacific Ocean. It was one of those evenings where you were convinced there was no place more beautiful in the world. 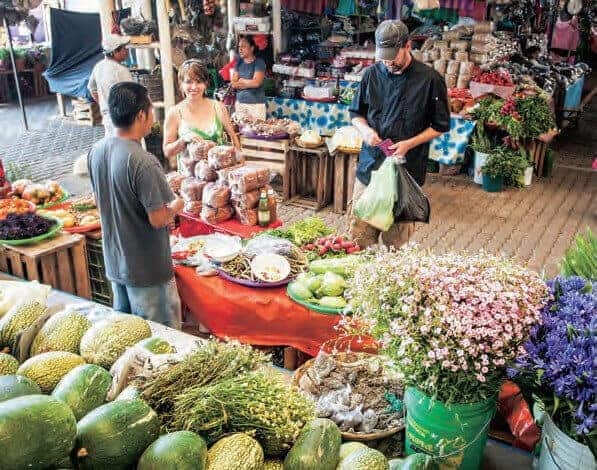 Since then, I’ve often seen Tony shopping for fresh fruit and veggies in the Benito Juarez Market in Puerto Escondido and we’ve chatted about mescal, Oaxacan cuisine and coffee. 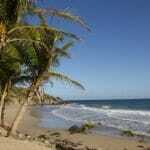 Fact is, in Puerto Escondido, if people aren’t talking about real estate, they’re usually talking about food. Each time we’ve talked, I’ve been intrigued by what he’s up to in his kitchen. Each time I saw him, I’d hint around asking for a recipeto share with A Taste for Travel readers. So, I’m happy to announce that we now have a recipe for you to try straight from The Mexykan kitchen. 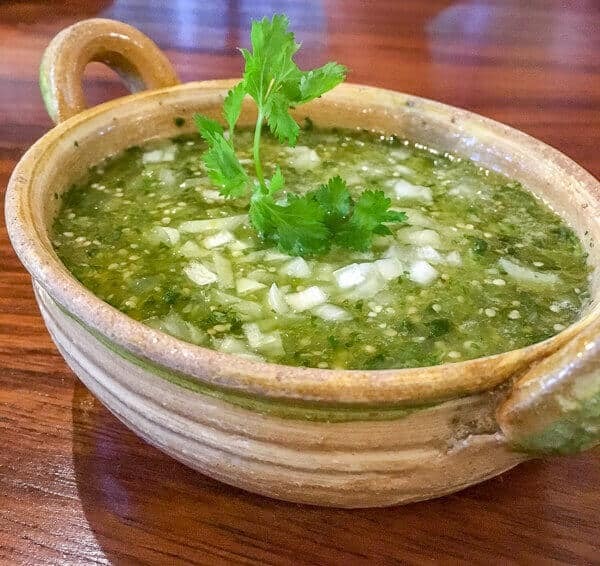 This recipe for Salsa Verde Mexicana is actually one of the recipes featured in his popular Traditional Mexican Salsa Cooking Demonstration Class, offered in Puerto Escondido. It features tomatillos ( also known as miltomates), onion, garlic and chile and is easy to whip up for your next party or gathering. You can also use salsa verde as a topping for chicken, chilaquiles, tacos and well you get the idea, it’s a versatile salsa that’s a staple in Mexican cooking. The most important ingredient in an authentic salsa verde is the tomatillo. Also known as the Mexican Husk Tomato, a miltomate and a tomate verde, this round green fruit is packed with nutrition and flavour. A member of the nightshade family, tomatillos grow on small plants and each of the round fruits is wrapped in a papery husk which MUST be removed prior to eating. The tomatillos in the above photo have had their husks ( also known as lanterns) removed. 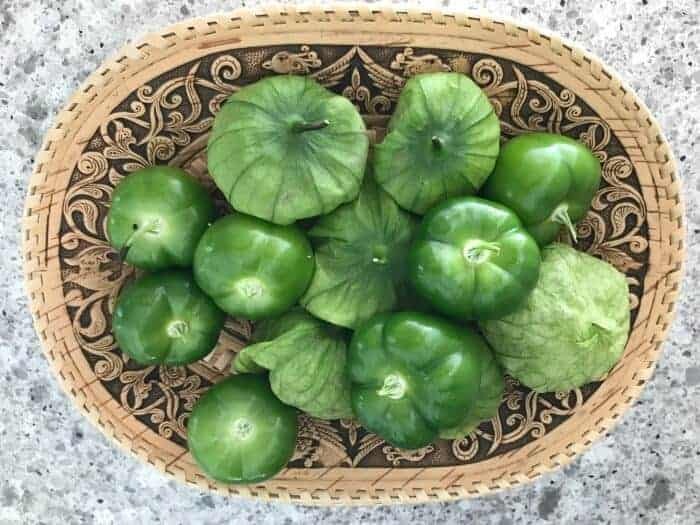 The husk (lantern), leaves, and stems of the tomatillo plant are toxic, so after husking a tomatillo, be sure to wash your tomatillos thoroughly to remove the sticky substance on the fruit. You might also want to wear gloves if you don’t want the stickiness to get on your hands. But don’t worry if you do. The sticky residue on tomatillos isn’t dangerous — its actually a substance known as withanolides, a naturally occurring chemical compound found within the family of nightshade plants. Scientists believe the sticky substance may act as a deterrent for feeding insects while the fruit is ripening. I’ve never peeled off a husk and discovered a huge bug lurking inside a tomatillo or seen any signs of insect infestation. What is the Flavour of a Tomatillo? What does a tomatillo taste like? Tomatillos are tart, acidic and slightly herbal in taste. The riper they get, the less acidic they taste. When shopping for tomatillos in the market, look for fruit with loose lanterns. The husk should be puffy and have pulled away from the fruit. The husk should be easy to peel off. The fruit of a ripe tomatillo is dark green rather than white. When ripe, they remain firm and don’t soften like a tomato. They store remarkably well — up to three weeks in a cool area. Versatile with just the right amount of kick, salsa verde is a staple in every Mexican kitchen. It’s fantastic for topping on chilaquiles, scrambled eggs, grilled chicken or tacos and also mades a great dipping salsa for tortilla chips. Plus, it stores for several days in the fridge. This recipe straight from The Mexykan Cooking Class is guaranteed to be a hit at your next BBQ or holiday party. If you try this recipe, please rate it and share your comments below. I’d love to hear from you! You can also FOLLOW ME on FACEBOOK, TWITTER, INSTAGRAM and PINTEREST for more authentic recipes from around the world. 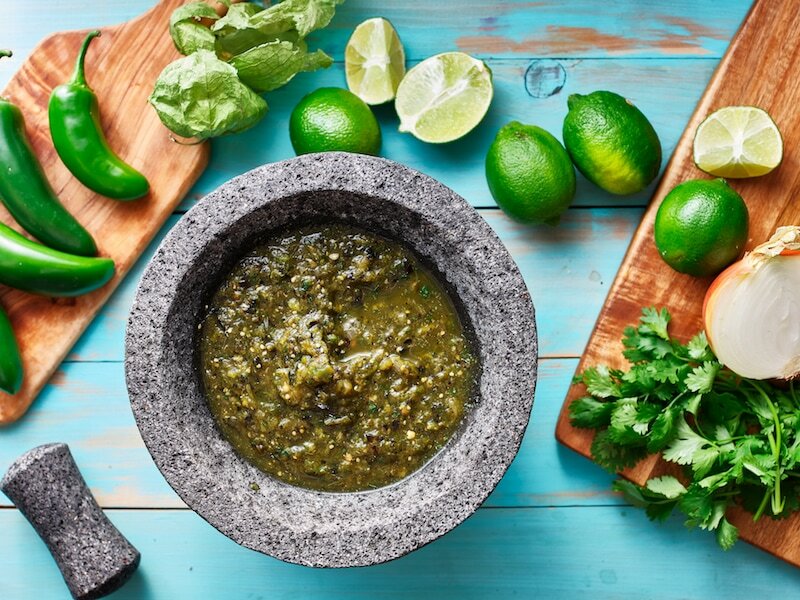 This easy recipe for green tomatillo salsa, from The Mexykan Cooking Class, has a fabulous fresh flavour that will add zip to grilled meats, tortilla wraps or even scrambled eggs. Cover tomate verde, chiles and garlic with just enough water to cover in small sauce pan. Simmer until the tomate verde starts to turn a drab olive colour. Be sure not to overcook. Strain the ingredients reserving the water. Place the salt, tomato verde, peeled garlic, cilantro and chiles into a blender jar, food processor or molcajete (Mexican mortar and pestle). Blend to a rough textured sauce, add reserved water as needed. Garnish with chopped white onion. The amount of hot chile you use depends on your heat tolerance. Start by adding just one and work up from there. If the salsa verde is excessively tart to your taste, try adding a small amount -- up to 1/2 tsp - of white sugar. 1. Watch, learn the techniques and taste six traditional Mexican salsas prepared by a trained chef. 2. Participate in a “Roll Your Own Taco Party” featuring six traditional Mexican salsas such as this salsa verde. 3. Enjoy fresh guacamole, corn chips, Oaxacan black beans and classic Mexican red rice. 4. Indulge in complimentary, refreshing Margaritas or ice-cold Mexican beer. 6. Sip unlimited ice-cold Mexican agua fresca (fresh fruit water). 8. Get a printed copy of all of the Mexican Salsa recipes. 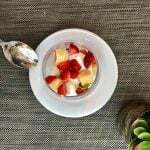 Get more recipes, travel tips and inspiration direct to your in-box with our free newsletter! Oh my, what gorgeous photos. The salsa looks mouthwatering. It would be worth the trip to Puerto Escondido to take a Mexykan cooking class or to get the specific fresh ingredients at the market. I’ve never heard of a tomato that had to be husked, or ChileTusta. I’m sure the produce tastes amazing, ripened by the Mexican sun! Hi Culture Tripper. The tomatillo is actually not a tomato at all. (Physalis philadelphica) is the scientific name of the plant. Chile tuxta is a chile that is native to the coastal region here in Oaxaca. It’s very picante and quite beautiful too. Here is a photo take by Belem, a cooking class guest from Azerbaijan. I’d be more than happy to give you an insiders perspective on the local market here in Puerto Escondido. www.themexykan.com is my website when you are ready to take a cooking class. 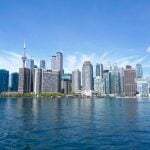 Thanks Michele for the awesome blog post about the Mexican cooking classes, the market tours, the private chef service and supper club events that I hold throughout the year. It’s been a labor of love following these dreams for nearly 30 years in the hospitality business. Preserving and sharing Mexican culinary traditions is a very fulfilling and rewarding experience. I love being able to directly share and teach the world class gastronomic history of Mexico with everyone interested. I thank you and am very grateful to you for helping to share my passion for food and hospitality with others from around the globe. I look forward to cooking for you again and again! Looks tasty. I love a good tomatillo sauce and even more so bringing home recipes from my trips. Thanks for sharing. Michele, what timing you have! I make several types of salsa myself, including tomatillo very similar to this recipe. Been making salsa for years, way before most people in the US even knew what a taco was! I have been craving REAL Mexican food for several weeks now and have this week made up my mind to get to Mexico for a few weeks this winter. I’m like you: I travel for the food. Where in Mexico do you recommend I not miss? Sounds like I need to take one of the Mexykan’s classes at the very least. If you love fresh food markets, beaches and relatively low prices, it’s worth checking out Puerto Escondido. Do you have a fave place you already like? I’m trying this recipe ASAP! I LOVE verde salsa!! Thanks for sharing. Food is such a great way to experience other cultures. Looks delicious – thanks for sharing.